Brighton hosted one of the fastest ever 10k races in recent years while the city’s marathon saw Helen Davies take her third title alongside Peter Le Grice’s men’s victory. There were also great races at Peterborough, Flitwick, Sheffield, Llanelli, Boston, Belvoir, Little Bromley, the Thames Towpath and Friskney! On a glorious day for British endurance running, the Brighton Marathon Weekend organisers must take immense credit for pulling together one of the most competitive domestic fields seen in some time. Belgrave Harriers’ Nick Goolab was imperious in victory on Sunday (April 14), taking more than two minutes off his PB to run a scintillating 28:22 course record for the win. 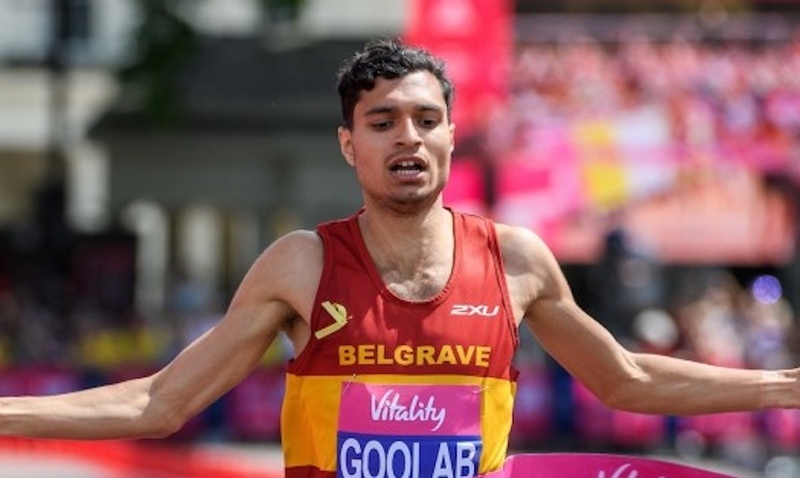 Goolab recently chatted to Fast Running about his race anxiety issues, but has clearly worked hard on conquering his self doubt to go straight to the top of the UK rankings for 2019. Southend’s Adam Hickey proved the power of a very busy cross country season that has seen him race the world championships following an impressive win at the UK Inter Counties with a 28:53 PB for second. Hallamshire’s Andrew Heyes was also rewarded with a 28:56 PB for third, while Cambridge & Coleridge’s fast improving Jack Gray was just one second behind in fourth with a 28:57 result. The strength in depth was astonishing, with Bideford’s Shaun Antell 5th, Leeds City’s Phil Sesemann 6th and Derby’s Ben Connor 7th. Their times were still provisional as we went to press, so check out the race organisers’ results website at www.resultscui.active.com to get the final times later tonight. Aldershot, Farnham & District’s London marathon-bound Steph Twell is in the form of her life, and here broke both her track and road 10k PB with a fantastic 31:58 result to win the women’s race by more than a minute. Keen to revise her marathon debut time of 2:30:11 set in Valencia last December, Twell has been busy racing on the roads this year. 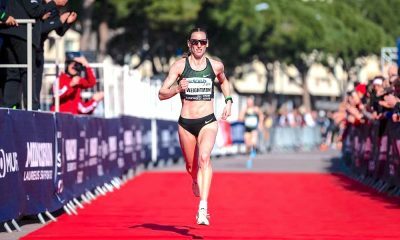 The 29 year-old took the win at the Armagh International 3k in 8:59 followed by a Chichester Priory 10k victory, two fast half marathons and a 10M PB in America just last weekend. Mhairi MacLennan from Edinburgh Uni Hare & Hounds was second in a new PB of 32:59. MacLennan recently changed coaches to Helen Clitheroe, so it will be exciting to see what the Scot can achieve over the rest of the year under the wing of one of the UK’s greatest ever athletes. AFD’s Emily Hosker-Thornhill followed up her English National Cross Country win with a fine 33:03 result her to claim the final podium spot, with Bristol & West Olympian Kate Reed just seconds behind in fourth with a 33:08 clocking. As the provisional results currently stand, 19 men broke 30 minutes and 37 women broke 40 minutes – incredible! The Brighton Marathon was just as exciting a race for spectators and racers alike, with Bristol & West’s sensation Peter Le Grice smashing the course record and his PB to win in a fast 2:16:23 on his debut in the city’s seaside event (April 14). The 31 year-old’s previous best was 2:21:08 from last October’s Jersey Marathon. What can Le Grice achieve in his next attempt at the distance based on this trajectory of improvement?! Also annihilating their marathon best was Paul Navesey in second, the Crawley ace slicing a massive five minutes off his PB to clock a fast 2:18:17. Clearly the southern city suits the 32 year-old, as he also won the Brighton Half Marathon back in February. While Brighton Phoenix’s Ian Leitch was only 17 seconds back in third with a 2:18:34 result, his run was possibly one of the most impressive of the day. Leitch is 43 years-old, and his PB before today was just 2:25:08 from last year’s event, where he finished fourth. Ipswich Jaffa’s England international Helen Davies was an utterly dominant winner of the women’s race in a 2:34:08 PB in windy conditions. 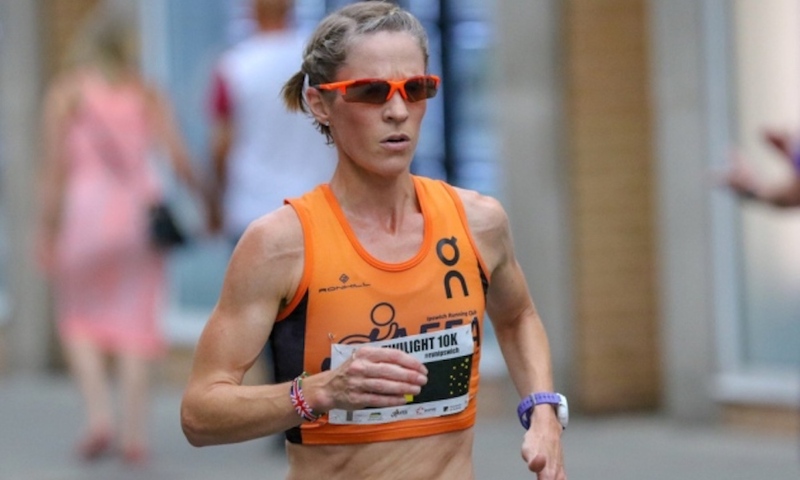 The 39 year-old is surely still on for a faster time in better weather, and, having taken three victories on the trot here in Brighton – significantly improving her times with each run – her confidence must be high going into her next event. A distant second was Datchet’s V35 Jill Collett in 2:48:16, which, although wasn’t a PB, does show how far this athlete has come in a relatively short space of time. She only broken three hours for the first time in 2017, and has steadily chipped away at all her race bests ever since. Third placed Jo O’Regan is really quite an incredible athlete, the Riverside Runner coming third here just one week after finishing in the same position in the Manchester Marathon! O’Regan couldn’t match her 2:42:15 PB set in the northern capital last week, but still managed a 2:49:41 result just seven days later. Another marathon was taking place on the same day in Peterborough (April 14) when the inaugural Sublime Events Peterborough Marathon saw wins for Ty Farrer and Emma Caplan. Hunts AC’s Farrer, a V45, took victory by more than 14 minutes in 2:41:11 from Fenland’s Lewis Saunders, who clocked 2:55:53. Third place went to Eye’s James Barrett. First lady and fourth overall was Bournemouth’s Emma Caplan, the 44 year-old clocking a superb 2:57:36 to win by nearly 16 minutes! Making her victory even more impressive is the fact she only gave birth eight months ago! Nancy Connolly was second in 3:13:03 – still a great time – while Kirsty Malone also made the podium with a 3:35:05 result. 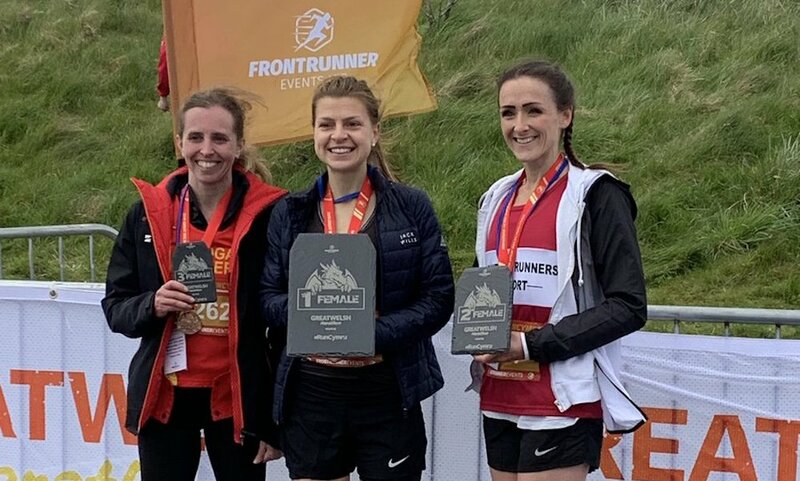 Phillipa Williams was an exciting winner of the Sheffield Half Marathon (April 14), running a speedy 77:25 for victory over Kimberworth Striders’ Lyndsey Eastman’s 79:29. Just three seconds back was Hallamshire Harriers’ Charlotte Ward, who clocked 79:32. Hunts AC’s Jamie Hall enjoyed a fierce fight to the line with Mo Saleh, with Hall just taking the win in 71:16 to Saleh’s 71:37. Meirionnydd RC’s Alex Lanz was never far behind in third with a 72:10 result. The Great Welsh Half Marathon and Marathon took place on Sunday morning (April 14), but with the provisional results still not showing accurate times we have taken the results from the Great Welsh’s own Twitter page. The top three women in the Great Welsh Marathon marathon were Katie Warren (3:04:47), Lizzie Dimond (3:12:07) and Crystal Goecker (3:12:15). The men’s marathon victor was Gethin Davies in 2:45:44, while Joseph Murray was second in 2:46:13 and Richard Foster third in 2:49:05. Melanie Wilkins took the half marathon title in 78:18 from Carys May Hughes (81:19, while Amy Evans was third in 93:29. Luke Williams was the men’s half marathon winner in 74:19 from Dean Summers (76:43) and Finn Arentz in third with a 77:29 result. The UK’s own Boston Marathon and Half Marathon saw fast wins in windy conditions on Sunday (April 14). Peterborough AC’s Phil Martin took the marathon victory in 2:34:14 from Retford’s Ben Harris, who ran 2:42:28. Not far behind was Sudbury Joggers’ Kieran Hayles, who ran 2:44:14. Sheffield Tri’s Hannah Peel won the women’s race in a strong 3:09:26, while Saffron Striders’ Rebecca White took second place in 3:11:59. V40 Abi Gooch from Redway Runners swiped the final podium place in 3:12:44. Cambridge Uni Hare & Hounds’ Emma Hodson took the women’s Boston Half Marathon win in 81:34, but it was Emma Weissblatt who stole the show in second – she is a V50 and ran a superb 82:04! Third place went to Sleaford Striders’ Emily Foran with a 87:31 result for the V40. Kent AC’s Sean Fitzpatrick took the men’s win in 73:04 from RN AC’s Adam Barlow (no, not that one! 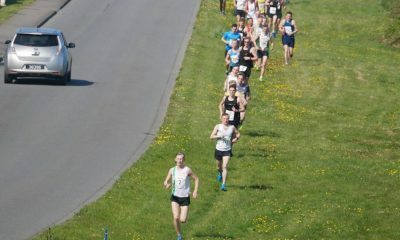 ), who ran 73:58 for second, a great time for the V40! Fellow V40 Mark Sands from Skegness & District was third in 76:14. The Fuller’s Thames Towpath 10M saw wins for Andy Bond in 55:28 and Marta Miaskiewicz in 62:43 on Sunday (April 14). While Miaskiewicz was a clear winner it was a tight battle for second, with Melissah Gibson just holding off Chloe Baker, their times 65:16 to 65:23. It was an even closer fight for the men’s minor positions, with, Jack Ramm just taking second in 56:49 from Jim Lurkins, who was just one second behind in third. 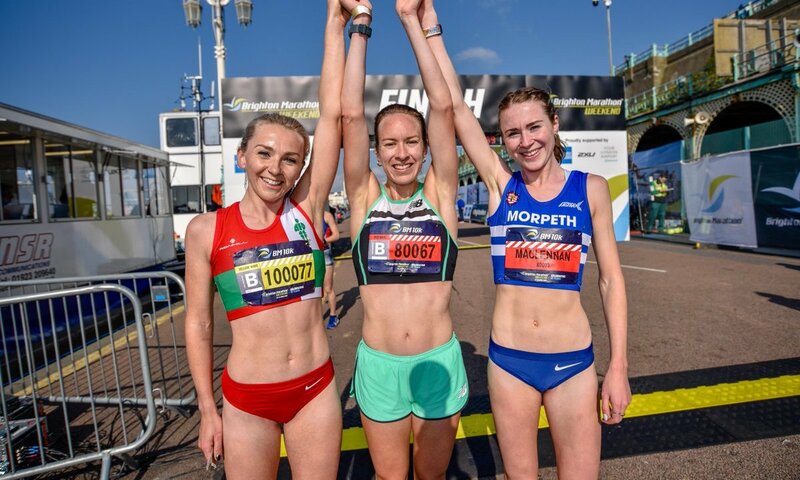 Sarah Chynoweth was the women’s victor at the Belvoir Half Marathon on Sunday (April 14) in 88:26 from Kristie Matthaiae (89:05) and Lisa Deacon (89:52). Michael Coltherd was a dominant winner of the men’s race in 73:28 from Chris Southam (77:00) and Richard Gibbs (78:17). 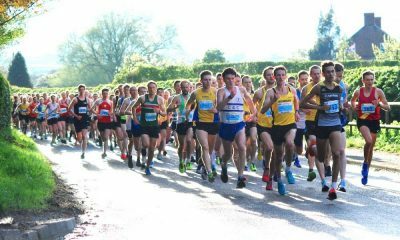 The Flitwick 10k in Bedfordshire (April 14) is always a tough challenge, with its endless hills truly testing any who take part. Bedford & County’s Peter Benedickter took victory by five seconds in 32:55 from Ampthill & Flitwick’s Tim Harris, who clocked 33:00. Not far behind was North Herts RR’s Thomas Webb with a 33:09 result. First woman across the line was Anna Larkins with 40:27, while Dacorum & Tring’s Hannah Bennett was second in 41:35. Charlotte Dunham took third with a 42:16 result. 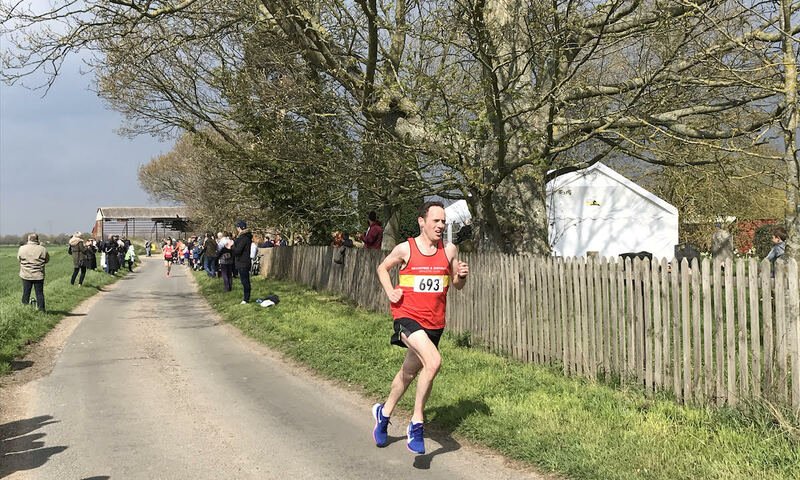 There were fast times at the Friskney Half Marathon in Lincolnshire on Sunday (April 14) with Boston & District’s Chris Cope running a classy 72:07 for the win. Dereham Runners’ Matt Pyatt proved he’s still very much a force to be reckoned with when he ran 76:34 for second, while Bushfield Joggers’ Brian Corleys also ran well to clock 79:20 for third. Corleys’ club mate Becky Witton ran superbly to take the women’s title in 1:43:46, ahead of Matt’s wife Lisa, who clocked 1:44:29. Third place went to Bushfield’s Susan Stevens with a 1:54:46 result. The Little Bromley 10k in Essex saw wins for Braintree’s Tim Wolfe in 32:40 and Springfield Striders’ Jackie Stratton in 37:15 on Sunday (April 14). This hugely popular flat and fast 10k costs just £8 to enter, and regularly has more than 500 entrants to a small village event. Hadleigh Hares’ Scott Ramsey was a close second in 32:49 while Framlington Flyers’ Jim Last was anything but in third with a 33:08 result. Colchester Harriers’ Aiko Henington was second lady in 37:36 while Springfield Striders’ Nikki Brockbank took the third spot in 38:12. 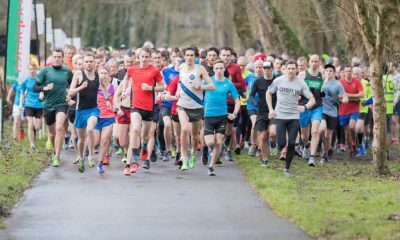 This week’s fastest UK parkrun times were incredibly quick once again, with the indomitable Hayley Carruthers making her debut at Bushy Park count in style with a super fast 16:05, while James Hunt ran 14:57 at Porthcrawl to add to his Welsh Cross Country Championships title earlier this year. Read the full top 10 report here.